Rovio has reached the sky and even into the Space, with its world-popular multi-platform game Angry Birds and it seems there is no stopping for the company. We have seen many interesting and cute accessories branded with Angry Birds out there like soft toys, stores, clothes and what not in the market but how about Credit Cards? 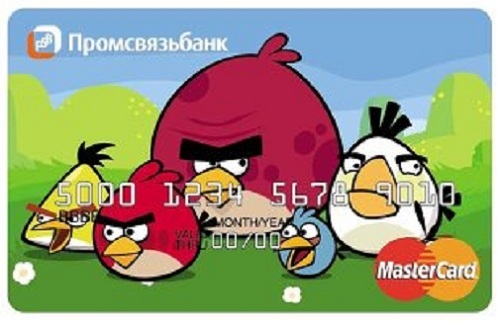 Well according to a report published in The Moscow News, Rovio is in high spirits to introduce Angry Birds branded credit cards in partnership with Russia’s Promsvyazbank as it attempts to spread its wings in the country. Together with Internet Retail Solutions or Irsol, the bank will produce these credit cards and will give these to its customers though there are no special perks to use the card, which most co-branded credit cards carry. Initially only a total of about 100,000 cards would be printed and after seeing the demand, which this first batch generates, more cards would be printed as per the needs. This would be the first Angry Birds branded product to launch in Russia and it is also an interesting one. We hope that these cards do very well and seeing the success, Rovio plans such cards in other countries too. Would you like to own a credit card which has those furious birds on it? Let us know below.